Flamenca Beach Commercial Centre - Picture of the very popular Flamenca Beach commercial centre located in the Orihuela Costa resort of Playa Flamenca on Spain's Costa Blanca coastline. 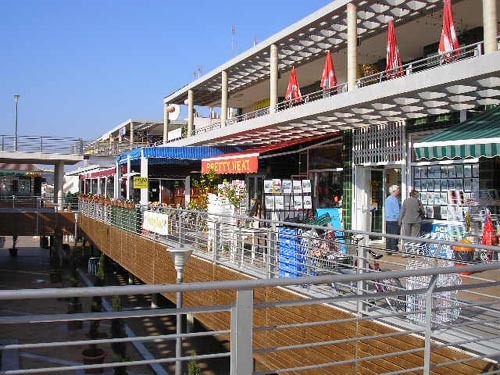 Flamenca beach has a wide range of shops, bars and restaurants and is a popular location for holidaymakers and residents alike. Summer evenings are very busy in Flamenca beach and there is plenty of live entertainment on offer in the various bars, if dining is more your thing then there is plenty of choice with restaurants offering dishes from all over the world, restaurants include Chinese, Indian, Italian, Hungarian, Spanish, English, Irish, Scottish and Thai. Visitors head to the centre from Playa FLamenca and all the surrounding areas.